Kamil Novak at the Opening Ceremony of the FIBA U18 European Championship. At the latest Education, Youth, Culture and Sports Council meeting, a number of European sports ministers expressed concern over the impact of commercial trends in elite sports on the integrity of the European sports model, based on solidarity. Kamil Novak explains what role the EU should play. 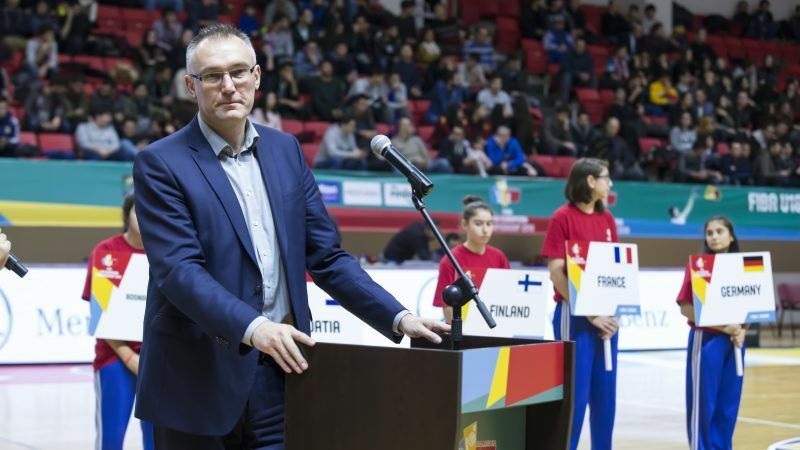 Kamil Novak is the executive director of the International Basketball Federation (FIBA) for Europe. As the Education, Youth, Culture and Sports (EYSC) Council met in Brussels last week, European sports ministers were overwhelmingly in favour of supporting the European sports model, which recognises the vital importance of national teams. They stressed the need to protect the competitiveness of domestic leagues against imbalance driven by the flow of money to a handful of major sport clubs. Quite tellingly, all twenty-eight ministers took the floor, suggesting there is a genuine and shared concern across the EU. Indeed, while the topic has a direct and urgent relevance for everyday operations of a number of sports organisations across Europe and beyond, it also pertains to the very essence of the European model of sport and to Europe’s vision of its collective future. Promoting European values through sport is one of the key pillars of the EYCS Council work. The EU vision states that sport plays a vital role, not only in individual health and fitness but also in shaping our wider European society. At a time when the EU faces an unprecedented number of internal and external political, economic and social challenges, including UK exit, slow growth, high unemployment, on-going migrant and refugee flows and a heightened terrorism threat, and its future form and character are being increasingly questioned, sport should be one of the most powerful cohesive elements. The European sport is based on a pyramid structure with the clubs as its foundations and regional, national, European and international federations forming the next layers. Mirroring this structure, sport in Europe has an important social role as it helps forge and strengthen local, regional, national and ultimately European identity by giving people a sense of belonging to a group. It unites players, spectators and the surrounding community, contributing to social stability and vitality. National team competitions play a critical part in this process and serve as a locomotive for the development of the sport in each and every country. They promote solidarity with grassroots sport and contribute to European integration through sport. They also inspire young people across Europe and from all walks of life and provide them with new opportunities. To some extent, we can imagine National Team competitions in Europe, such as the EuroBasket or the UEFA EURO, as an equivalent of the Erasmus exchange programme in the sense that they both prompt discovery of other European nations and strengthen the sense of belonging to both one’s own nation – and a broader European community. Yet the integrity, equity and viability of the national team competitions are under threat because some elite clubs have selected to compete in private leagues, putting in danger the entire European sports model. The concentration of revenues in the hands of a few elite clubs can easily leave all others behind. In my sport, for instance, the national team basketball competitions are being very concretely harmed by a de facto boycott from 16 Euroleague clubs. Due to a calendar clash engineered by Euroleague Commercial Assets (ECA), operators of the Euroleague, out of the 77 Euroleague players who represented their National Teams in the EuroBasket in September 2017, only 13 were released by their clubs to participate in the first game of the November 2017 FIBA Basketball World Cup qualifiers. This 80% drop represents a trend which is expected to continue over upcoming qualifying games since ECA decided that also its 2nd-tier competition, called EuroCup, will play games during the National Team windows in November 2018. An elite league where the large majority of clubs do not have to qualify each year on merit also has an impact on the level and intensity of competition within domestic leagues and the aspirations of their member clubs. This too runs contrary to the spirit of the European sport. This model aims to promote the universality of sport and the widest possible sharing of available resources and talent development opportunities for clubs, players, arenas, promoters, sponsors and the media. By contrast, the closed league system sustained by ECA aims to concentrate the wealth into the hands of a few elite clubs and promoters in a limited number of countries. ECA’s practice is directly reducing the value of Europe’s national team and national league competitions, making them less attractive to viewers, fans and partners, and risking their marginalisation in the longer run. FIBA is facing this situation now, but the same underlying forces have been affecting many other sports. The continuing lack of a negotiated solution is causing irreparable reputation and economic harm to National Team competitions in Europe. There is an urgency for EU to establish a standard to restore a harmonious coexistence of national team and club competitions in accordance with EU competition law, respecting the authority of the international federations to define a balanced calendar for their sport. It is high time to formally acknowledge and legally defend national teams’ contribution to building an inclusive, responsible, and forward-looking European society – and ultimately, to preserving a sustainable future for European sport.